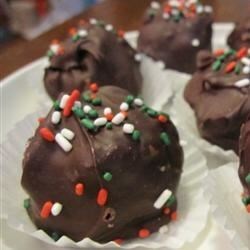 "This is another recipe for Peanut Butter balls. This one I got from my 96 year old neighbor, Mrs. Lucille Savage. She still makes them at Christmas and now I do too." Rich chocolate meets peanut butter in these deliciously simple treats. Great hit for kids and adults. Only used 2 cups sugar and 4-5 cups of rice krispies as I found it too wet to roll properly. I liked the crunchy texture that I remembered.